You can see in yesterday’s post he and his buddy are imitating each other with their head bobs which is a great way to help a child learn how to imitate, with themselves being imitated (does that sentence even make sense). Our occupational therapist tries to encourage mimicking by using songs with hand movements, like pat-a-cake, and a few she may have even made up on her own. I absolutely adore the fact that she sings with Noah (which can help a child improve his verbal memory.) We say a lot of awesome things about our physical therapist, but our occupational therapist is equally as awesome and I am amazed at the fantastic work she has done with Noah. It took Noah a very long time to learn to clap, so we love to use songs that involve some serious clapping for him imitate. I can do what you can do! Fun! Once a child starts to mimic it opens up a whole new area of development and interaction. 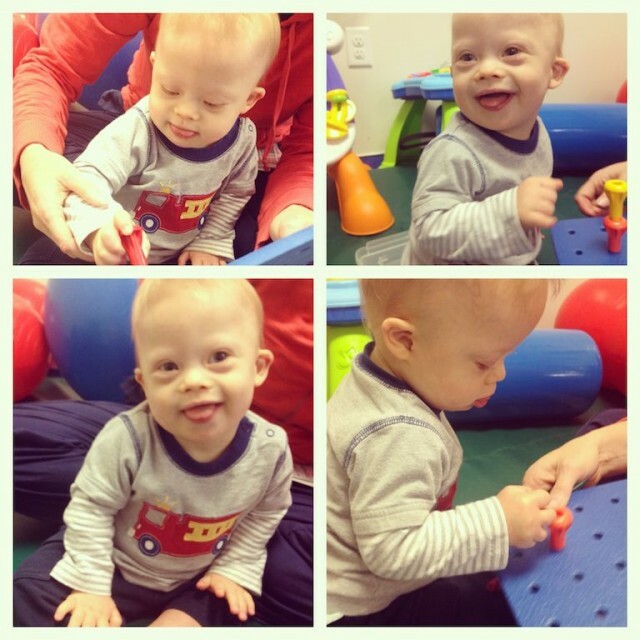 Imitation and pretend play is another area that can be delayed in children with Down syndrome. Typical newborns have been shown to imitate their mothers shortly after birth. There have been several studies that show that a newborn will mimic facial expressions such as tongue protrusion, mouth opening, and pouting practically out of the womb. There are also other beliefs that an infant must be imitated to learn imitation, but I have seen the videos of the first theory so I think being imitated just reinforces the behavior. There are several milestones in the toddler years that involve imitation. Several of the fine motor skills are probably best learned by imitation from stacking blocks, using a crayon, and the one I can’t wait for imitating me cleaning…maybe I have to actually do that for it to happen. 🙂 Simply being able to use toys is enhanced when imitation and pretend play is involved. Imitation continues to be important in the future as well, and is one of the reasons we want our children included in the classroom. While it may be a struggle to get our children to imitate, it eventually becomes one of their strengths. Our kids will model their behavior after the other children in the classroom and learn how to thrive in the real world and interact with their peers. I even used this method through out my medical training as we often said the phrase “see one, do one, teach one” as a way of mastering procedures. I think many of us would say it is much easier to do something after watching someone do it first, and the same will be true for our children. Is your child imitating you yet? What are some funny things they have done? Thanks so much for the kind words. Do you have any children? If so, how old are they? Our daughter just turned 2 and her imitating has really took off about 5 months ago. She LOVES to sing songs and do the motions for “Head, Shoulders, Knees & Toes”, “Itsy Bitsy Spider”, “Patty Cake” and others. She watched us for so long and then it seemed like all of a sudden she just started joining in! She was absorbing and gathering information until one day it just clicked. And she has also learned fine motor skills by watching us – stacking blocks, putting the rings on the post (the Ikea one that is quite difficult). And she continues to get better. It’s so exciting to watch! I love that you also mentioned the importance of inclusion for our kids. It’s crucial and I continue to hear so many real-life stories of how much their child has benefited – not to mention the typical kids in their classrooms! Thanks for all you do to help educate our world about Down syndrome! I have just started doing Head, Shoulders, Knees and Toes with Noah. It is pretty funny. He has the head part down, but those shoulders are hard to find. Great post! Noah is so cute! I couldn’t agree more that clapping and more look exactly alike 🙂 Especially as we get so excited with signing that he usually ends up clapping anyway. Charley is 13-months old. He hasn’t made any vocal imitation yet. He is a mover and likes to crawl all over the places and loves to walk by holding our hands or furniture. Our ST came to our house once a month to help him to talk but not succeeded yet. Charley doesn’t have teeth yet. Thanks Rick. I enjoy watching your website, Noah’s pictures & videos every day. Charley and Noah both are very handsome boy, love their puffy cheeks. Other than Charley, I have 3 and a half years old twin girls. They keep Charley busy and Charley has very good core muscle tone. I will have to ask our PT if Charley needs treadmill to help him to learn walking or not…. All parents worry about their kids, no matter they have disability or not. Before Charley was born, I always worried about my girls would be abducted. After Charley was born, I started to worry about if he will have lukemia, thyroid (blood test confirmed he has hypothyroid and he has 1.5 pill a day now) problem, eye sight (he is pretty far sighted), if he will walk, all kinds of worries….. I am happy having him in our lives and enjoy every seconds with him. But sometimes, I can’t stop to fear the unknown future. Gorgeous photos and great post! My son Sammy (14 months) still doesnt clap but he does imitate stuff. Those photos made me smile though, because he sits exactly like that with his legs really wide apart. Clapping will come, we waited forever!! GO NOAH! Absolutely love to see him in action! Clapping for him! Grace (23 months old) crosses her arms across her chest when she sees other people cross their arms, she gets a laugh of encouragement. She mimics clapping, bouncing objects and laughter. Interesting and comforting to hear that verbal mimicking comes later. Grace also isn’t interested in saying ma-ma but says da-da for her Dada with no problem… what’s up with that?! Thank you for sharing Noah and your experiences with us! It is so great to watch Noah’s development. He sure is a cutie!! His gains are wonderful. I tear-up watching Noah make developmental gains just like I do for my own little Olivia. The imitation, the clapping, the referring to himself with signs are all soo huge but to the untrained eye (like someone who isn’t a parent, especially of a child with special needs, or a health care professional, etc.) they simply look like a little guy having fun. Great job! Olivia is now 25 months old. She does a lot of physical and verbal imitation. She has been doing so for some time. She imitates everything from washing her face after eating and then the table, to pushing open doors, getting dressed (at least trying), feeding her dolly, counting, etc, etc. It seemed like it took forever for her to really ‘clap’ though. She would wave her hands close to each other for the longest time. We watched for intently, just waiting for her to make contact. lol She has it figured out now and claps for everything. Anyone anywhere can get applause and a loud “yay!” if she sees something she thinks is worthy of praise, like a stranger picking up a dropped item in Wal-Mart. I love it when Olivia sings Twinkle, Twinkle Little Star and Itsy Bitsy Spider. It is so great to lay in bed in the morning and hear her little voice practicing her songs over and over until her words are clear. Makes our early rises so enjoyable. What I find particularly funny though is when she “folds laundry”. She picks up an item of clothing and shakes it in the air, bundles it all up then places it on the floor and says ‘dere’ (her version of “there”). Too cute! And a great help too as there is lots of laundry to be done in a family of five. Keep up the great work Noah!!! That sounds absolutely precious to hear her sing. Sounds like she is doing so well. Noah will clap with TV which we think is really funny. He has yet to do it with strangers, but he thinks they are pretty scary right now. We’re working on it, but no real imitation yet. Spencer is 9 months old and we’re awaiting a referral for his ear drums, which have been unresponsive for the audiologist recently. He is not imitating motions yet, either, despite encouragement to clap especially. He does, however, like to clap my hands for me! At what age did you start watching Signing Time with Noah? I loved the series with my older daughter so I’m looking forward to both of us working on it with Spencer. Joslyn loves playing patty cake too! Wheels on the bus and the itsy bitty spider are her favorites too! The funniest thing she imitates though is my husband’s burps! Thanks so much for writing these articles. We check in on Naohs Dads page often. The information you give relates so well to us and we have learned more from your sight than anywhere. Our son Jax has started to imitate. I was able to read this article and learn how to help him not only imitate more but know the next step to learn with the verbal. We love our PT and OT help and just signed jax up for speech. When we go in for his appointment I will be sure to ask for help in how to teach Jax to imitate verbal. Thanks so much for helping my family we love you guys. Those pics are so cute!! !